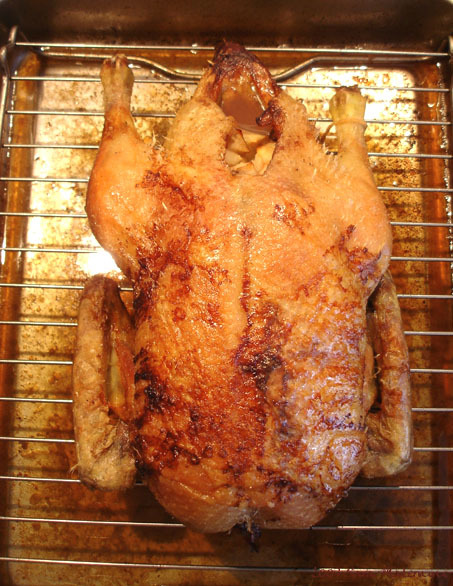 This roasted duck is so simple that shouldn’t need a recipe, but I know many people are afraid to roast whole animals. I found it rewarding!!! My duck was 1. 7 kilos. It was stuffed with a diced pear and sprinkled with some salt. It cooked for 2 hours at 150° C, then 30 minutes at 220° C. I took it out of the oven when, piercing it with a skewer, the juices form the leg joint came out clear. Allow it to rest for 10-15 minutes before to carve it. It was juicy, but crispy on the outside. If I have to tell you the whole truth, I’m from the school that likes duck medium rare (rare for breasts alone), so if you prefer your bird well done, allow an extra 30 minutes at 150° C.
Serve it with the pear and some greenery.